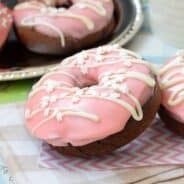 Easy Gourmet Doughnuts made in 30 minutes! 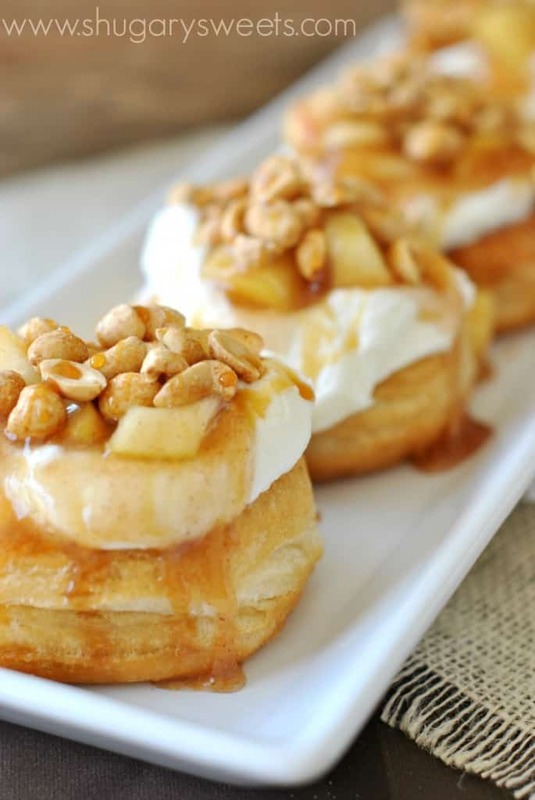 Pillsbury Grands Biscuits are the perfect base to these doughnuts piled high with Cream Cheese frosting, apple pie filling, caramel and peanuts! Let’s all do a quick, collective, “OMG.” Yes, I’m for real with these doughnuts. You may recall my trip to Austin Texas when I happened to eat my weight in doughnuts. These Apple Pie Doughnuts, AKA “The Carney” were by far my favorite that I tried! And today, you can make them at home, in under 30 minutes. Need a showstopper of a breakfast to serve your mother in law? One that will make your friends fatter than you in their swimsuits at the pool this summer?? Drop off a plate of these! I also used Pillsbury Grands Biscuits to make the biggest doughnut I could! Only a Grands biscuit could puff up high enough to endure the topping overload that was about to happen. And it still tasted buttery and rich, and soft!! Some of my friends who devoured doughnuts with me in Texas are also creating copycat versions today! Be sure you check everyone out. Cherry Bombs by My Life as a Mrs. In a large, heavy bottomed skillet, heat oil about 1/2-3/4 inch high. Depending on your size skillet will determine how much oil is necessary. Bring oil to a sizzle when you drop a couple drops of water into it. Separate biscuits and using a one inch circle cutter (I used a cannoli tube) pop center hole out of each biscuit so it resembles a donut. Fry each biscuit for 2-3 minutes each side. Allow to cool and dry on paper towels. While donuts are cooling, prepare apple pie filling (or use jarred/canned to save time). In a small saucepan, bring sugar, cornstarch, cinnamon, salt, nutmeg and water to a boil. Boil for 2 minutes, whisking constantly. Add apple slices (or diced) and reduce heat to simmer. Cover and simmer for about 6-8 minutes, until apples are fork tender. Remove from heat and cool. For the frosting, beat butter and cream cheese for 3 minutes until fluffy. Add powdered sugar and milk and beat an additional 3-5 minutes. To assemble, frost cooled doughnut with cream cheese frosting. Top with cooled apple pie filling, peanuts and caramel sauce (divide evenly among the 8 doughnuts). ENJOY. These are gorgeous! That frosting!! I have never craved a donut so early in the day like now!! I feel the same way today! 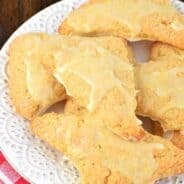 So many great recipes in the round up! I think I may be disappointed by any other doughnut i ever eat. Ever. I want these NOW! I am loving the way they look! All that apple – just dripping off. Mmmm, reminds me of apple hand pies I used to eat as a kid, but wayyy better! 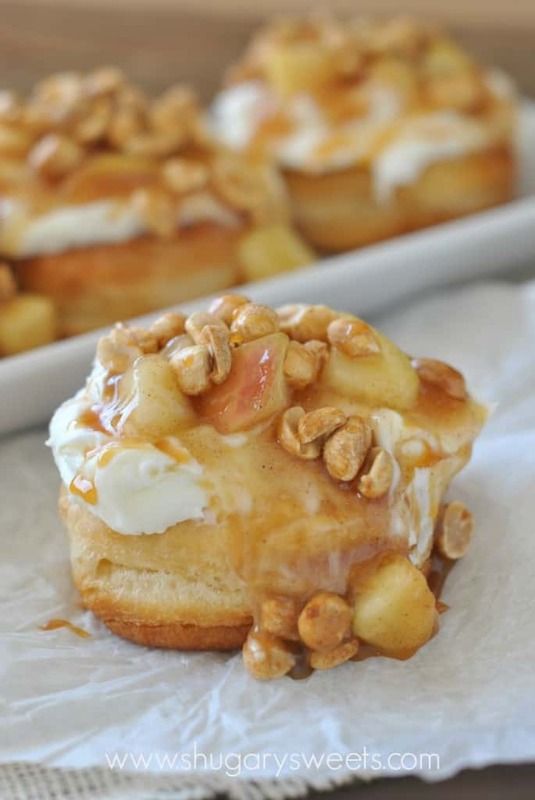 these look amazing, i love the idea of combining apple pie and doughnuts! oh my gosh!! That looks amazing! These look amazing!! So glad I got to finally meet you even if it was just for seconds! Austin was so fun, can we go back now? These look gorgeous Aimee! Way to hit the nail on the head! Ha, another amazing looking copy cat donut!! I think this one wins. What could be better than an apple pie donut? Great pictures, you have captured the sinfulness of these donuts. Cream cheese on top of a donut! Love it! This is a great twist if you want to serve single apple pies to guest! You are a genius. Where were you when I was writing this post?? great idea, and so true too. These are a perfect single serve apple pie dessert! Ha… another amazing looking copy cat donut!! I think this one wins. What could be better than an apple pie donut? Great pictures, you have captured the sinfulness of these donuts. I’ll take a dozen, please. These look absolutely incredible! 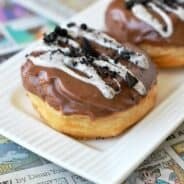 I just had my first taste of Gourdoughs last month and I am hooked! Cream cheese frosting? And doughnuts?? And CARAMEL??? I’m down!! This is literally dessert for breakfast! These sound absolutely amazing and I should not be reading 10 posts about donuts before I even eat breakfast. Oh my gosh, this was one of my favorites! Love, love, LOVED it. You nailed it, Aimee! You had me at apple – seriously – in love. I love how easy these seem and how AWESOME they look!! Thanks Sues! they really are easy with all the shortcuts! Oh these apple doughnuts were amazing!!! You recreated them so perfectly!!! 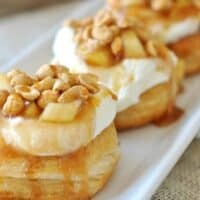 Now I seriously need to make these ones….love the apples and peanuts on top of cream cheese frosting!!! Hellloooo beautiful! These look incredible, Aimee! Thanks Amanda! right back at ya! Love the shortcut! I am in love with all of these donuts, it is making me sad I missed Austin all over again! I wanted to have this one so bad at Gourdough’s but ended up trying 4 others instead. I really have to make this at home now!! Anything with apple pie is fine by me! Love this! I need one of these for lunch. 🙂 YUM! You’ve outdone yourself…AGAIN. These look so incredible — they’re very photogenic! I saw them on Foodgawker before I saw them here and oh boy do they look great. Thanks Marcie. You’re too sweet! How yummy do these look?! And I LOVE that you can make them so quickly. There are so many good doughnut recipes in this round up that I’m going to need to start going to Barre 7 days a week instead of 3. Stop it… this looks so good and I bet tastes just as good (if not better) as the one we shared in Austin! It was only lacking in company! So impressed that you made these with biscuits! Irresistible!! Thanks Julie, shortcuts that taste great are so awesome! Oh my goodness – I’m totally dying over this one! Niiiiice! Oh my gosh. Yah, these need to come to mama real soon! Love this! Wow. Wow… WOW…! Did I mention I’m impressed? Love these! Woah. I had never heard of Glazed and Infused. My gawsh….the Terry’s Toffee, and Maple Bacon Long John…I’m in love! Cream cheese frosting+caramel+apples+salty roasted peanuts!!!!! Hellllloooo! Perfection! I want! Wait. Wait. Wait. HOLD UP. A Gourdough’s copycat blog hop?? BEST DAY EVER!!!!!!!!!!!!!! I live in Houston and I LOVE Gourdough’s. Even though Austin is only a short 3 hour ride away, that’s too far to get there as often as I want!! This is the greatest thing ever but this is also definitely going to be my undoing. Ahh! Oh man, the Carney is also def one of my favs and it looks like you did it justice! I’m totally craving it now. Did you try Granny’s Pie? I think that ties with the Carney for my fav. SO GOOD. 3 hours? I would be there every weekend!!! Enjoy the donuts!!! OMG, that topping is dangerous! I just drooled all over my computer. YUM! Ok I’m joining in with the OMG, I need these in my life! What a donut! How incredible do these look! Under 30 minutes?!? Aimee you are an evil genius – so quick and easy but so dangerous! Houston Texas Consulting is creating dynamic and innovative ways to market and promote our clients brand. By having exclusive contracts with our clients, we are able to find the solutions that they need to achieve success. I made these this morning and they were a huge hit! I will never get store-bought donuts again! Thank you for a fabulous recipe! Helpful tips. Fortunate enough us I ran across your website by chance, and i’m surprised the reason why that accident couldn’t came about previously! My partner and i book-marked them. Oh my gosh! I am dyyyyying over here!! I’ve seen recipes that used the Pilsbury Grands before, but never really considered using it myself. After seeing tees pictures and hearing how delicious it is… Well, you’ve convinced me that it must be done and I must use this recipe because I can’t imagine my life without these apple pie donuts. I just can’t. Why are there peanuts in this?